Figure 1: (a) Geoex 3D surveys in Equatorial Guinea. (b) Map of recently awarded blocks offshore Equatorial Guinea and São Tomé and Príncipe. Multiple 3D data volumes are available which have been designed to explore Equatorial Guinea’s distal hydrocarbon systems down-dip of proven hydrocarbons (oil and gas) in both the Lower Miocene and Upper Cretaceous-Paleogene plays. Geoex’s 3D multi-client surveys cover over 8,400 km2 and shed further light on the prospectivity of this fascinating region. Several licences have recently been awarded to international operators in areas offshore São Tomé and Príncipe, Gabon and Equatorial Guinea, as illustrated in Figure 1. The exploration potential of this region is considered to be very high and interest from oil companies has risen dramatically, as demonstrated through new bidding activity in these three countries. Figure 1. The displayed Full Stack (Pre-Stack Time Migrated) seismic traverse runs from west to east between blocks EG-16 and EG-05 and illustrates the two main plays (Paleogene and Lower Miocene turbidites) recognised offshore deepwater Equatorial Guinea. Geoex Ltd, which has acquired several multi-client 3D surveys in Equatorial Guinea, has already shown these surveys to a number of operators during 2017. The data packages will be available for viewing at the Geoex offices in Epsom, UK throughout 2018. A scoping interpretation of these data provides new insights into the regional geology and petroleum prospectivity of this deepwater basin. AVO-supported prospects are recognised in channel/fan systems in both Upper Cretaceous-Paleogene and Lower Miocene plays and the data illustrate the importance of the structural control imparted by reactivation of the oceanic crustal fabric. 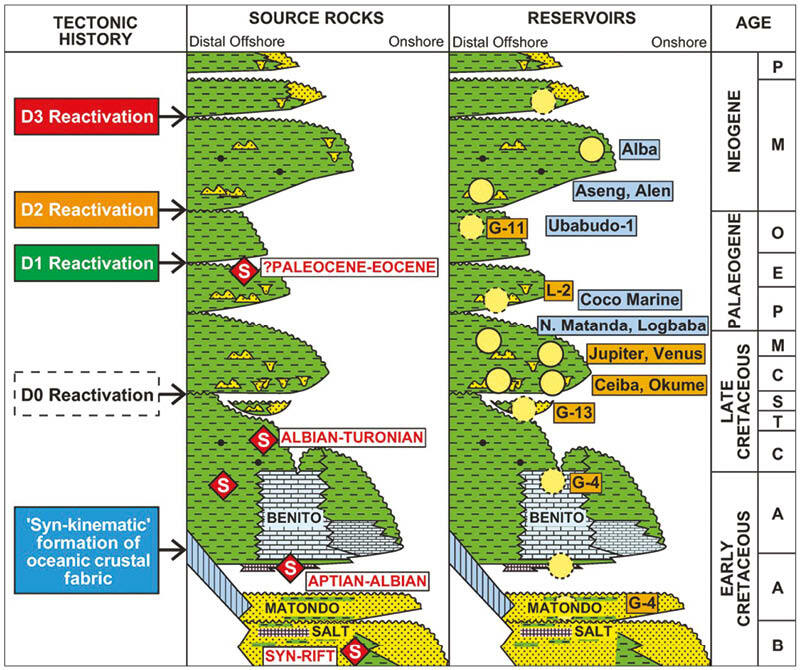 Figure 2: Stratigraphy and petroleum geology of the Douala-Rio Muni margin. From Lawrence et al. (2016) Deformation of oceanic crust in the eastern Gulf of Guinea: role in the evolution of the Cameroon Volcanic Line and influence on the petroleum endowment of the Douala-Rio Muni Basin. In: Sabato Ceraldi, T., Hodgkinson, R. A. & Backe, G. (eds) Petroleum Geoscience of the West Africa Margin. Geological Society, London, Special Publication, 438. Geologically the area overlies the distal parts of the Douala and Rio Muni Basins situated on oceanic crust, here referred to as the Douala-Rio Muni margin. This region developed as an ‘oblique margin’ where oceanic crust is strongly offset continent-wards by oceanic transforms into relatively shallow water. Several gas-condensate and oil discoveries have already been made in upper/middle fan reservoirs overlying oceanic crust. Source rocks for the recognised petroleum systems have been identified geochemically in the Upper Cretaceous and Paleogene section, while ‘live’ oil encountered in Tertiary sandstone cores from the Ubabudo-1 well drilled on the volcanic island of São Tomé has been geochemically linked to Middle-Upper Cretaceous source rocks (Figure 2). The new Geoex 3D seismic data provide a near-continuous coverage over the region between the islands and seamounts of the Cameroon Volcanic Line and the Douala-Rio Muni margin (Figure 1b). The data have imaged Miocene sand systems working southwards along the axis of the Douala Basin and Cretaceous-Paleogene sand systems migrating westwards out from the Rio Muni continental margin (Figures 3 and 4). The data also show basement structure reflecting the syn-kinematic fabric of oceanic crust in the form of spreading-ridge structures and oceanic fracture zones. 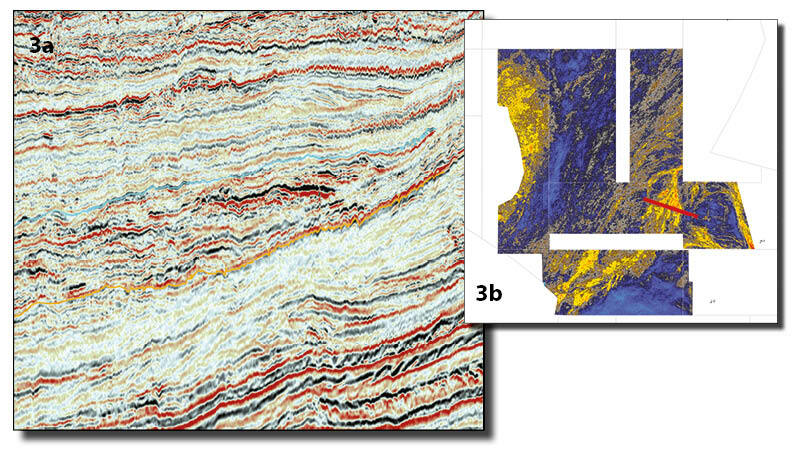 Significant deformation of the overlying sedimentary section is observed, related to re-activation of basement structure during several tectonic episodes (Figure 2). This includes strong crustal uplift along fracture zones during the early Miocene which played a role in the formation of the volcanic islands and seamounts of the Cameroon Volcanic Line. Figure 3: Amplitude response of an Aquitanian turbidite fan. Line of section shown in red on Figure 3b. Data source: Geoex Ltd. The combination of underlying structure and basin-floor fan systems has contributed to enhanced trapping possibilities in the 3D area. Prospects have been delineated by combining structural mapping with the application of Amplitude Versus Offset/Angle (AVO/AVA) techniques. Type II/III AVO anomalies (low acoustic impedance, high porosity hydrocarbon-filled sands) characterise several prospects which have been identified on the Geoex 3D data. Similar Type II/III AVO anomalies have proven successful in every discovery to date in the Douala Basin blocks O & I (Lower Miocene play) and in the Ceiba and Okume fields of the Rio Muni Basin (Upper Cretaceous play). Figure 4: Far trace amplitude response of a distal Upper Cretaceous basin floor turbidite fan. Line of section shown in red on Figure 4b. Data source: Geoex Ltd. Figures 3 and 4 show examples of amplitude extractions on Lower Miocene and Upper Cretaceous-Paleogene systems, which both exhibit AVO responses. 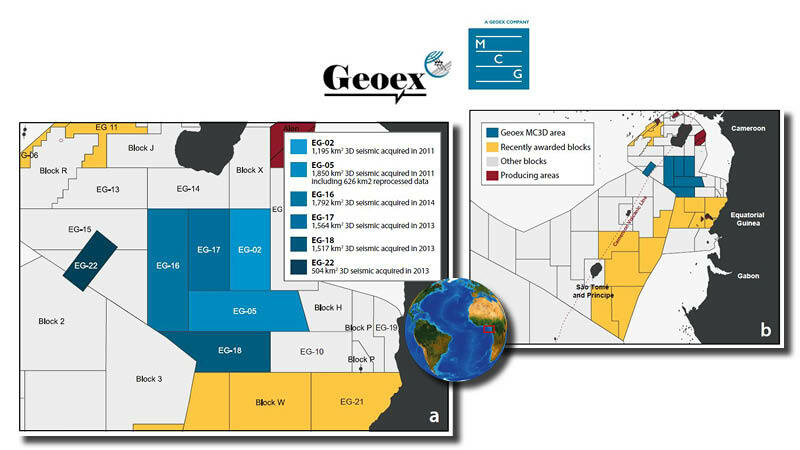 SAER Ltd have produced five interpretation reports in cooperation with Geoex Ltd covering the blocks EG-02, EG-05, EG-16, EG-17 and EG-18 using the discussed 3D data. Scoping hydrocarbon volumes for 26 possible oil and gas prospects have been calculated in these reports. Geoex Ltd would like to thank Ministry of Mines and Hydrocarbons for their continued support during all stages of the multi-client 3D projects offshore Equatorial Guinea. Uruguay’s state oil company, ANCAP, has recently awarded offshore blocks in the Round II bidding to British companies BP and BG, French company Total, and Irish company Tullow Oil.